Singapore is made up of three main ethnic groups: Chinese, Malays, and Indians. The Chinese ethnic group makes up the majority (75 percent) of the population, followed by the Malays (15 percent) and the Indians (8 percent). Each ethnic group is internally diverse. However, in the view of most Singaporeans, the divisions within each ethnic group are far less significant than those between groups. The government of Singapore makes a concerted effort to promote ethnic diversity while emphasizing a shared Singaporean identity among the population. This has generally been successful. Overall, most Singaporeans think of themselves as Singaporean first, followed by their ethnicity background. This has been a deliberate goal of the Singaporean government since independence was established in 1968. At the same time, the ethnic groups maintain separate identities and see little difference between race and culture. As a result, someone who is ethnically Indian is expected to act and think like an Indian, not like a Chinese. 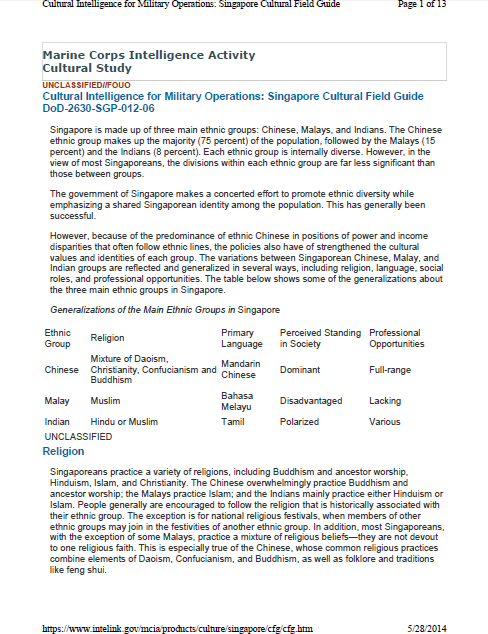 These stereotypes persist in Singapore and factor into various issues related to military operations, including who leads, who gets promoted, and who is excluded. In general, the ethnic Chinese advance to top positions while the Malays do not. The dominance of the primarily Chinese and Indian People’s Action Party (PAP) began in the mid-20th century, when a charismatic and enduring Chinese leader, Lee Kwan Yew, took over Singaporean politics. Although he recognized and tacitly accepted Chinese dominance in Singaporean politics, Lee Kuan Yew also believed that the island’s success depended on racial harmony and a government publicly free of “Chinese chauvinism.” Therefore he created a constitutionally multiracial state, but one that drew on Confucian values of strong family and powerful government. He also made economic development a national priority, and to a large degree successfully instilled this sense of purpose in Singaporeans. As a result, Singapore is one of the most modern and advanced countries in the world. Singaporeans have not forgotten past ethnic clashes, particularly the 1964 riots between Chinese and Malays. The government is sensitive to Chinese chauvinism, and tries to balance Chinese identity with that of other ethnic groups and a greater Singaporean nationality. This means that Chinese are somewhat limited politically—advocating for Chinese values and rights, for example, is virtually impossible. Material development also does not benefit all ethnic groups equally. The Chinese continue to dominate most sectors of the Singaporean economy, government, and military. Their long-term success largely comes at the expense of the Malays, who at one time not only made up the largest ethnic group, but also held high positions in the colonial administration, especially in areas of internal security and public safety. The Malays today, by contrast, are the poorest ethnic group, and they are often excluded and discriminated against in subtle ways. Malays tend to obtain a lower level of formal education than members of the other ethnic groups. Those who continue past high school tend to specialize in vocational education programs. Malays make up only a small percentage of university graduates and students enrolled in higher education. As a result, as of the 1990s, 86 percent of Malays had low-level occupations. Only roughly ten percent could be classified as professional and technical workers (including schoolteachers), or administrative and managerial personnel. Discontent among Malays is now associated with radical Islam. The issue has become more pronounced since the attacks of 11 September 2001 and the arrest of several Jemaah Islamiah terrorists in Singapore in December of 2001. In the minds of most Singaporeans, Malay ethnicity is tied to the Islam. Singaporean Malays are overwhelmingly Muslims, and are less integrated into daily Singaporean life than the other ethnic groups. For many Singaporean Malays, Islamic law provides important guidance in various aspects of their life, ranging from family and economic affairs to social etiquette and politics. The government of Singapore rules with very little opposition based on ethnicity. In fact, Singapore’s culture has reached a point where overt ethnic politics almost has become taboo. Instead, the primary focus is on finding a comfortable balance between maintaining ethnic identity while promoting a greater, Singaporean national identity. Within Singapore, there has been a concerted effort by the government to create a national identity and definition of what it means to be Singaporean. The national identity cuts across all ethnic groups and includes notions of civic responsibility, peaceful multiculturalism, and economic achievement. Government policies related to education, National Service (compulsory military service), and housing are helping to unify the population. In fact, National Service is considered the great leveler in Singaporean society. As a result, although Indians, Chinese, and Malays all maintain distinct cultural customs and traditions, they tend to view themselves as Singaporeans, and their allegiance to Singapore is as important to them as their ethnic or cultural heritage. The Malays were dominant in Singapore before colonization, and held positions of power even into the British administration. However, since the 1950s, the Chinese have been taking an increasingly larger share of economic and political power. This is due to Chinese business networks, often called bamboo networks, that are used to foster business relations between people based on kinship, common dialect, trade association, education, and other commonalities. As a result, Chinese family businesses are extremely common in Singapore. They combine elements of Chinese business style and Western management practice. These networks have contributed greatly to Singapore’s rapid economic development over the last half-century. While Chinese enterprises and business have helped develop Singapore’s economy, the development of the economy has, on the whole, helped to smooth intra-ethnic tensions among the Chinese and between ethnic groups. However, as Chinese businesses on the island continue to look to mainland China for business, it is increasingly difficult for non-Mandarin speakers to find jobs in business. The Indians hold a disproportionate share of the jobs at the very top and bottom of the economic and political scale. Many of the recent arrivals to satisfy Singapore’s need for foreign labor are Indians, but ethnic Indians also make up a relatively large portion of successful Singaporean businessmen, attorneys, and politicians. The Malays leave benefit among ethnic groups in Singapore. Most Malays work as production workers or in other less-skilled professions; less than two percent of all administrative and managerial workers are Malay. The Chinese tend to blame the Malays cultural lack of emphasis on work and education for the Malays’ problems, while the Malays tend to think Chinese persecution and exclusion prevent their advancement. Many Malays from Johore, Malaysia, come daily to work in Singapore. Popular culture of the United States, including music, movies and fashion, is very popular in Singapore. The and Singapore share strong relations and cooperate on economic and security issues. The role in the region is perceived to be critical in maintaining peace and regional security. The Singapore and military share very close relations; Singaporeans wholly favor the military. Personal behavior by Singaporeans toward service members will be very professional and courteous, with little hostility or negativity. However, Singapore’s public has expressed concern over operations in Iraq and the subsequent potential to radicalize Muslims in their country. Malay Muslims are particularly sensitive to actions affecting Muslims in other countries and may be more likely than members of other ethnic groups in Singapore to view U.S. operations and armed forces personnel critically.